Rock Band 3 is a music video game, and the third main game in the Rock Band series. Harmonix Music Systems is the primary developer for the game, with additional development by Backbone Entertainment on the Wii and DS versions. The game is published and distributed by MTV Games and Electronic Arts, respectively. 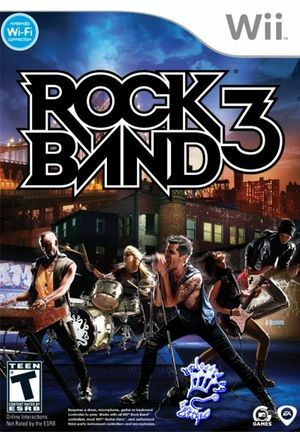 As with previous games in the series, Rock Band 3 allows players to simulate the playing of rock music and other genres using special instrument controllers mimicking lead and bass guitar, drums, and vocals. Rock Band 3 expands upon previous games by including three-part vocal harmonies—previously used in The Beatles: Rock Band and Green Day: Rock Band—and support for a keyboard instrument, a MIDI-compatible 25-key unit. Official servers are still up, once Dolphin is set up for online play on official servers. A original NAND dump is needed, mainly for serial number and already online activated profile. Even though all online functionalities works (playing, leaderboards, score posting, etc) the music store doesn't, believed to be due to some error with the Wii Shop Channel. The Main Menu for the game can lag and have audio stutter even when Dolphin is running full-speed. This is normal, and actually happens on console as well. Microphone reported to work as of Dolphin 5.0-2428 with USB Passthrough support via USBdk and white-listing Rock Band Logitech USB microphone in Dolphin Configuration. Dolphin often crashes when running the game with the microphone added to the list. The graph below charts the compatibility with Rock Band 3 since Dolphin's 2.0 release, listing revisions only where a compatibility change occurred. r6561 Windows 7 AMD Phenom II X4 955 @ 3.7GHz ATI Radeon HD 5770 Black band members, Menu laggy, fwrite errors in menu, in-game (solo)=great! 3.0-201 Windows 7 Intel Core i5-2500K @ 4.6GHz ATI Radeon HD 6950 Black band members, laggy menu, stuttering gameplay (despite enabling "limit by FPS"). Game had trouble picking up quick successive notes on both the GH World Tour guitar and drumset. Unplayable for difficulties hard and expert. Extreme audio and video calibration needed. This page was last edited on 1 July 2018, at 07:09.